Earning an online MBA in Healthcare Management allows you to pursue a career in one of the fastest&8208;growing and most lucrative fields in the country. The Bureau of Labor Statistics projects medical and health services manager positions to increase 20% by 2026, which is much faster than the national average job growth rate of 7%. The median annual salary for these professionals is $98,350. With a growing population of seniors, graduates of online MBA programs in healthcare management often work as nursing home administrators and long-term care managers. Healthcare management professionals may oversee hospitals, manage departments, or run small private practices. Each of these roles requires the management skills and knowledge of current healthcare law, which online MBA programs with a concentration in healthcare offer. What Else Can I Expect From an Online MBA in Healthcare Management Program? George Washington University, GW Online ranks #1 on The 15 Best Online MBA in Healthcare Management Degree Programs! George Washington University enrolls students from 130 countries and boasts a wide network of successful alumni. Located four blocks from the White House, GW also provides its students with prestigious internship opportunities and 450 student organizations. The school’s 26,000 students attend classes on three campuses in the District of Columbia area and online. Individuals seeking to advance their business careers can enroll in the school’s master of business administration program, which offers several delivery formats. Learners can specialize in business and leadership in the healthcare field by choosing the 55-credit MBA in healthcare management. This fully online program features part-time enrollment, asynchronous delivery, and several certificate options. Students study business and management strategies and their applicability in healthcare environments. Distance learners also take a business core that develops competencies in areas such as financial and managerial accounting, strategic management, organizations and human capital, and decision making and data analysis. Participants specialize in healthcare by taking courses that include healthcare IT security, clinical management, healthcare quality analysis, and knowledge management. Individuals pursuing this online MBA further enhance their healthcare credentials by earning one of six graduate certificates in specializations such as clinical and translational research, regulatory affairs, and clinical research administration. Students typically earn their degree within five years. Admission requires a bachelor’s degree, GRE or GMAT scores (unless waived), and at least three years of professional experience (with at least some experience in the healthcare field). George Washington is regionally accredited by the Middle States Commission on Higher Education (MSCHE). The online MBA in healthcare management program is fully accredited by the Association to Advance Collegiate Schools of Business (AACSB). Johns Hopkins University ranks #2 on The 15 Best Online MBA in Healthcare Management Degree Programs! The nation’s first research college, Johns Hopkins University has maintained high standards in teaching and research since its founding 140 years ago. The school enrolls 24,000 students in more than 260 programs. Students unable to attend classes on the main campus in Baltimore, or at several other satellite locations spread across the globe, can opt for eLearning options. This flexible MBA program gives working professionals the freedom to earn a degree online on a part-time basis. The school’s Flex MBA program consists of a robust business curriculum and a variety of concentrations, including one in healthcare management. The 54-credit degree features a business core that develops students’ competencies in areas such as accounting and financial reporting, corporate finance, business law, decision models, and business leadership and human values. The business school also provides students with a comprehensive suite of electives, covering topics that include entrepreneurial ventures, wealth management, and real estate funds and portfolio management. Students in the healthcare management concentration examine healthcare financing, managing healthcare services, and applied and behavioral economics in healthcare. While learners have up to six years to complete their online MBA, the average completion time is 3.5 years (with students taking two courses each eight-week term). Distance learners pay the same tuition, regardless of their state of residence. Admission requires a bachelor’s degree earned with a minimum 3.0 GPA, GRE or GMAT scores, and at least two years of work experience. Johns Hopkins University is regionally accredited by the Middle States Commission on Higher Education (MSCHE). The online MBA in healthcare management program is fully accredited by the Association to Advance Collegiate Schools of Business (AACSB). University of Cincinnati ranks #3 on The 15 Best Online MBA in Healthcare Management Degree Programs! The University of Cincinnati ranks as one of the nation’s top public research schools. The university enrolls 44,000 students and is the largest employer in the region. The curriculum at UC combines rigorous academics with practical experiences. Additionally, Cincinnati Online provides eLearning options to learners unable to attend classes in person. Among these distance offerings is UC’s online MBA, which offers several specializations, including one in healthcare. This MBA, with a concentration in healthcare administration, trains students about business competencies through a mix of academics, research, and hands-on experiences. The 38-48-credit curriculum includes a business core, which covers strategic management, managerial economics, financial management, management of operations, and decision models. Students cultivate proficiency in healthcare by taking two required courses in healthcare systems administration and health economics. Learners further build on their healthcare repertoire by choosing concentration-related electives. Areas of focus include healthcare finance, leading teams in healthcare, health information technology, and global health systems. Students acquire hands-on experience through a capstone experience and other projects. Faculty deliver the program using seven-week terms to facilitate accelerated learning. The business school offers multiple starts dates throughout the year, and students typically complete the online MBA program in 12-24 months. Admission requires a bachelor’s degree earned with a minimum 3.0 GPA, prerequisite courses for non-business majors, and a minimum of three years of relevant experience. The University of Cincinnati is regionally accredited by the Higher Learning Commission (HLC).The online MBA in healthcare management program is fully accredited by the Association to Advance Collegiate Schools of Business (AACSB). University of Texas at Dallas ranks #4 on The 15 Best Online MBA in Healthcare Management Degree Programs! The University of Texas at Dallas offers 141 degrees and boasts one of the best business schools in the state. Business administration ranks as one of the school’s most popular graduate programs. Working professionals interested in earning an MBA can enroll in the school’s professional MBA program (PMBA), which can be completed entirely online or in hybrid format. The PMBA offers several concentrations, including one in healthcare leadership and management. This 30-credit business major covers financial accounting, marketing management, statistics and data analysis, organizational behavior, and IT for management. Students cultivate proficiencies in healthcare leadership and management, studying topics such as healthcare informatics and healthcare economics. Learners apply management principles by using case studies and engaging in projects focused on the challenges faced by healthcare organizations. Students complete an internship at an organization or go on an international study trip during spring break. The majority of working professionals in the PMBA program take classes on a part-time basis, enrolling in an average of six credits per semester. Although students take most classes online, some electives may require on-campus study. Learners can enroll in the fall, spring, or summer. Admission requirements include a bachelor’s degree, GRE or GMAT scores, and prerequisite coursework in calculus. The University of Texas at Dallas is regionally accredited by the Southern Association of Colleges and Schools Commission on Colleges (SACSCOC). The online PMBA program is fully accredited by the Association to Advance Collegiate Schools of Business (AACSB). Quinnipiac University ranks #5 on The 15 Best Online MBA in Healthcare Management Degree Programs! A private school in southern New England, Quinnipiac University offers more than 100 degrees on three campuses in the cities of Hamden and North Haven, Connecticut. The school’s curriculum emphasizes career readiness with theoretical coursework and practical experiences. Quinnipiac offers several online degrees, including a 46-credit MBA with a healthcare management track. The MBA core covers financial decision making, managerial economics, organizational behavior and leadership, and decision making in a global economy. Students use 15 credits to specialize in healthcare by investigating quality management in healthcare facilities, integrated health systems and managed care, and the legal aspects of healthcare delivery. Learners also examine the financial management aspects of their careers as they apply financial theory to healthcare administration. Students completing this MBA degree online choose from several electives to supplement their studies, focusing on areas such as health policy and politics and HR management in healthcare administration. During a consulting practicum, students work to solve a practical healthcare organization challenge under the supervision of a faculty member. This practicum involves gathering of data, analyzing and interpreting information, and writing a report that addresses the client’s problem. Distance learners also develop professional skills in areas such as collaboration, problem solving, and ethical reasoning. Admission requirements include a bachelor’s degree and GRE or GMAT scores. Quinnipiac University is regionally accredited by the New England Association of Schools and Colleges (NEASC). The online MBA program is fully accredited by the Association to Advance Collegiate Schools of Business (AACSB). Simmons College ranks #6 on The 15 Best Online MBA in Healthcare Management Degree Programs! Situated in central Boston, Simmons College is a women’s college (at the undergraduate level) specializing in the liberal arts and professional education. However, both men and women can attend graduate programs at Simmons; 4,000 women and men enroll in grad programs, including degree tracks in business and healthcare. The school’s online MBA in healthcare — HealthCareMBA@Simmons — prepares working professionals for managerial and leadership positions. Most of the curriculum focuses on management principles from a healthcare perspective, integrating theory and practice to develop critical thinking and analytical skills. Students complete most of the 50-credit curriculum of this online MBA from a distance, although they must participate in two immersions. Students attend synchronous online classes in classrooms with a 15-to-1 student-to-faculty ratio. The curriculum includes the study of managerial accounting, quantitative analysis, the health system, health economics, financial reporting and analysis, healthcare strategic management, and healthcare quality and measurement. Students carry out their immersion experiences in big cities around the country, during which they study in business environments, apply managerial and analytical skills in practical scenarios, and learn from business leaders during workshops and other activities. Participants can access career services through a virtual career center. The department also provides one-­on-­one advising and helps students network with employers. Learners who take two courses per semester can complete the degree in as few as 24 months. Distance students all pay the same tuition, regardless of their residency status. Admission requires a bachelor’s degree, exceptional academic grades, and at least one year of full-time experience in the field of healthcare. Simmons College is regionally accredited by the New England Association of Schools and Colleges (NEASC). The online MBA in healthcare program is fully accredited by the Association to Advance Collegiate Schools of Business (AACSB). University of Scranton ranks #7 on The 15 Best Online MBA in Healthcare Management Degree Programs! A private school in Pennsylvania, the University of Scranton delivers academic programs in the Jesuit liberal arts tradition. The school enrolls more than 5,000 students in programs across three schools and colleges. In Scranton’s online MBA program, students learn a Jesuit approach to the bottom line while emphasizing ethics and social responsibility. This completely online degree is designed to meet the scheduling needs of working professionals. The MBA program offers several specializations, including one in healthcare management. This 36-credit MBA in healthcare management provides learners with a business education that is comprehensive and practical, focusing on technology-enhanced management skills applicable to the healthcare sector. The business core delves into accounting for management, managerial economics, operations management, and organizational behavior. Alternatively, the healthcare management concentration covers healthcare law, hospital administration, healthcare financial management, and health informatics. Additionally, a global health management course trains healthcare professionals to successfully manage in multicultural and global contexts; the course exposes students to differences in healthcare systems and services in other countries, focusing on topics such as politics and geography, demography and health status, and the organizational structure of healthcare systems. MBA students can access a repository of useful information through the school’s online business and leadership resource center. Students looking to earn an online MBA without GMAT requirements may be interested in this program — only a bachelor’s degree is required to apply. The University of Scranton is regionally accredited by the Middle States Commission on Higher Education (MSCHE). The online MBA in healthcare management program is fully accredited by the Association to Advance Collegiate Schools of Business (AACSB). Saint Joseph’s University ranks #8 on The 15 Best Online MBA in Healthcare Management Degree Programs! For 160 years, Saint Joseph’s University has provided learners with a Jesuit education rooted in the liberal arts. Located in Philadelphia, SJU enrolls more than 8,000 students in 137 programs, some of which can be pursued through eLearning. The school’s MBA offers a concentration in health and medical services administration; this distance program gives students increased flexibility and allows them to enroll full-time or part-time. Learners can take courses entirely online or in a hybrid format in classrooms with an 18-to-1 student-to-faculty ratio. Participants take 33-53 credits, depending on their academic background. The business core consists of six courses and cultivates skills in areas that include financial management, managerial economics, managing work organizations, and business analysis and financial reporting. The healthcare track immerses students in the study of pharmacoeconomics, supply chain management in healthcare, coding coverage reimbursement, healthcare marketing, and pricing in the healthcare industries. During a required cross-functional capstone, learners apply theoretical principles and administrative practices to complete tasks. In keeping with the school’s Jesuit tradition, students also cultivate critical thinking and ethical decision-making skills as they engage in leadership development. Full-time MBA students can earn their degree in one year. The program enrolls students in the spring, fall, and summer. All eLearners pay the same tuition, even if they live outside of Pennsylvania. Admission requires a bachelor’s degree and GRE or GMAT scores. is fully accredited by the Association to Advance Collegiate Schools of Business (AACSB). Widener University ranks #9 on The 15 Best Online MBA in Healthcare Management Degree Programs! A former military college, Widener University educates students on a 110-acre main campus in Chester, Pennsylvania. Widener’s student body is almost evenly divided between undergraduates and graduate students, and enrollees learn in classrooms with a 13-to-1 student-to-faculty ratio. Widener also provides distance learning opportunities through its virtual arm. Individuals seeking an advanced business degree can enroll in the school’s 33-credit online MBA, which offers a concentration in healthcare management. This degree provides a rigorous business education that develops students’ leadership competencies. The curriculum core includes classes in strategic financial management, leading organizations and people, managerial economics, and accounting and managerial decision making. Students take three concentration-specific courses that examine issues in healthcare policy, community health management, and methods to develop management skills. Although faculty deliver the MBA program entirely online, students without any experience in the healthcare industry must complete a local internship. In addition, leadership coaches teach five required non-credit professional development workshops designed to help learners develop a career plan, build their professional network, and fine-tune their ethical decision-making skills. Faculty encourage students to supplement coursework with hands-on learning activities. Students typically earn their degrees in 18-24 months. Distance learners pay the same tuition, regardless of their state of residence. Admission requires a bachelor’s degree earned with a minimum 2.7 GPA and GMAT scores. Widener University is regionally accredited by the Middle States Commission on Higher Education (MSCHE). The online MBA in healthcare management program is fully accredited by the Association to Advance Collegiate Schools of Business (AACSB). West Texas A&M University ranks #10 on The 15 Best Online MBA in Healthcare Management Degree Programs! Established in 1910 as a training college for teachers, West Texas A&M University enrolls 10,000 students on a 176-acre campus in the city of Canyon. The school offers several eLearning options for graduate students, including an online MBA with several specializations. Students can complete the school’s MBA in healthcare management fully online or in a hybrid format. The curriculum requires 31-49 credits, depending on a student’s past academic coursework. Learners without an undergraduate degree in business administration take foundational courses in financial accounting, statistics, and corporate finance. The 28-credit business core, taken by all students, includes the study of econometrics, organizational behavior, strategic management, accounting for decision makers, and quantitative analysis in business. Students use nine healthcare management elective credits to tailor their degree, investigating topics such as the legal aspects of healthcare, IT in healthcare business, communication for healthcare managers, and healthcare marketing and public relations. Most students complete this online MBA program in two years, although learners can graduate in as few as 18 months. Admission requires a bachelor’s degree earned with a minimum 3.0 GPA, GMAT scores, and at least two years of experience in healthcare. West Texas A&M University is regionally accredited by the Southern Association of Colleges and Schools Commission on Colleges (SACSCOC). The online MBA in healthcare management program is fully accredited by the Association to Advance Collegiate Schools of Business (AACSB). University of Texas at Tyler ranks among The 15 Best Online MBA in Healthcare Management Degree Programs! One of 14 institutions in the University of Texas System, UT Tyler educates 10,000 students in northeast Texas. UT Tyler also hosts three satellite campuses in the region and offers online classes through its virtual arm. Those seeking to advance into administrative or leadership roles in healthcare can develop important skills and competencies by enrolling in the school’s online MBA in healthcare management program. The 36-credit curriculum of this degree track gives students a solid business foundation. Course topics include organizational behavior, advanced financial management, accounting for management control, and strategic leadership processes. Learners master the use of quantitative decision-making techniques during a course where they study statistics, linear programming, and operational models. This concentration walks students through healthcare operations with special topics in healthcare management, an analysis of the American healthcare system, and a survey of healthcare marketing in contemporary society. Learners complete their online MBA degree in as few as 12 months. Students in the online MBA program all pay the same tuition, regardless of their state of residence. Individuals employed at one of the school’s corporate partner organizations may be eligible for a tuition discount. Admission requires a bachelor’s degree earned with a minimum 3.25 GPA and GMAT scores. The University of Texas at Tyler is regionally accredited by the Southern Association of Colleges and Schools Commission on Colleges (SACSCOC). The online MBA in healthcare management program is fully accredited by the Association to Advance Collegiate Schools of Business (AACSB). Ohio University ranks among The 15 Best Online MBA in Healthcare Management Degree Programs! More than 36,000 students attend Ohio University, attending classes on the school’s main campus in Athens as well as on other satellite campuses scattered across the state. The school supplements its on-campus offerings with eLearning programs, which enroll approximately 8,000 students. The school’s 35-credit MBA can be completed online. The program emphasizes entrepreneurship, strategic leadership, a global perspective, and professional development. Students customize their online MBA by pursuing one of four concentrations, including one in healthcare. In the MBA core, learners examine topics such as managerial finance, organizational behavior, accounting for executives, data analysis for decision making, and the strategic use of information. The nine-credit healthcare concentration prepares graduates to assume senior management roles in the field. Learners take three required courses covering healthcare delivery in the U.S., healthcare finance, and healthcare law. Although the majority of coursework can be completed online, fMBA students must attend at least one weekend leadership development workshop on campus. Some students also opt to participate in immersives. Learners can complete the MBA program in as few as two years. Admission requirements include holding a bachelor’s degree earned with a minimum 3.0 GPA and 2-5 years of professional experience. Ohio University is regionally accredited by the Higher Learning Commission (HLC). The online MBA in healthcare management program is fully accredited by the Association to Advance Collegiate Schools of Business (AACSB). Hofstra University ranks among The 15 Best Online MBA in Healthcare Management Degree Programs! Hofstra University is a private school located in the town of Hempstead on Long Island. Students can access 290 programs, delivered in small classes, on a campus just 25 miles from the Big Apple. Hofstra’s business school hosts a 45-credit online MBA in strategic healthcare management, which features a cohort model. The MBA core develops learners’ business competencies in areas such as financial accounting, operations management, managerial finance, and marketing analysis and management. This degree plan focuses on how strategic business management can be applied to healthcare, covering healthcare finance, health law and ethics, and health services human resources. Students also examine the role of information technology in healthcare delivery and apply management principles to develop health services information systems. Graduates learn how to enhance the operations of physician practices, hospitals, managed care organizations, and other facilities. Students enrolled in this MBA online degree program also learn about global corporations and their business operations during an overseas practicum. Distance learners must also attend two four-day residencies on campus, where they meet and learn from peers and faculty. Individuals typically complete the degree in two years; however, some students opt for a non-cohort model, which may let them graduate faster. Admission requires a bachelor’s degree and GRE or GMAT scores. Hofstra University is regionally accredited by the Middle States Commission on Higher Education (MSCHE).The online MBA in strategic healthcare management program is fully accredited by the Association to Advance Collegiate Schools of Business (AACSB). University of North Alabama ranks among The 15 Best Online MBA in Healthcare Management Degree Programs! Alabama’s oldest four-year public school, the University of North Alabama educates nearly 7,000 students annually. The school’s catalog consists of 140 majors and concentrations. Distance learners can choose from an array of degree options. For example, UNA’s business college provides eLearning options that serve 700 graduate students. These distance options emphasize flexibility and affordability. The school’s online MBA has a concentration in healthcare management, which trains professionals how to solve practical business challenges. The 34-credit curriculum includes a core that develops students’ business proficiencies in areas such as corporate financial strategy, management policy, strategic marketing analysis, and accounting for strategic decision making. Nine concentration credits examine issues related to strategic planning and marketing for healthcare management. MBA students who want to expand their skills can take additional credits to earn a certificate in project management. Business students at UNA have access to a variety of entrepreneurship opportunities, such as “3-Day Startup,” which helps students start their own companies. Learners can also participate in a student incubator and mentorship program. Distance learners pay the same tuition, regardless of their residency status. Admission requires a bachelor’s degree earned with a minimum 2.5 GPA and relevant professional experience or GMAT scores. The University of North Alabama is regionally accredited by the Southern Association of Colleges and Schools Commission on Colleges (SACSCOC).The online MBA program with a concentration in healthcare management is fully accredited by the Association to Advance Collegiate Schools of Business (AACSB). Florida Southern College ranks among The 15 Best Online MBA in Healthcare Management Degree Programs! Florida Southern College serves as the state’s oldest private college. Located in Lakeland, the school administers several programs that emphasize engaged learning. In addition to more than 50 majors, the college offers a strong internship program and 43 study-abroad options. Florida Southern College also provides nontraditional and graduate students with a comprehensive suite of programs through its online programming. The school’s 44-credit MBA with a certificate in healthcare management offers two modes of delivery: a fully online pathway and a blended format where students meet on campus two Saturdays each month and complete the remaining coursework online. Learners study a business core, in which they develop advanced competencies in areas such as quantitative and qualitative analysis, complex decision making, leadership of self and organizations, and managing across boundaries and borders. While completing the healthcare management certificate, learners cultivate the technical and leadership skills necessary to serve as effective healthcare managers. Participants study topics such as healthcare policy, healthcare finance, and informatics. Faculty from the nursing school co-teach healthcare electives. The program’s accelerated curriculum allows students to graduate in as few as 16 months. Learners also complete consulting projects for actual clients, participate in an executive mentor program that pairs them with a business executive, and choose from a variety of international field experiences. Admission into this online MBA program requires a bachelor’s degree and GRE or GMAT scores. Florida Southern College is regionally accredited by the Southern Association of Colleges and Schools Commission on Colleges (SACSCOC). 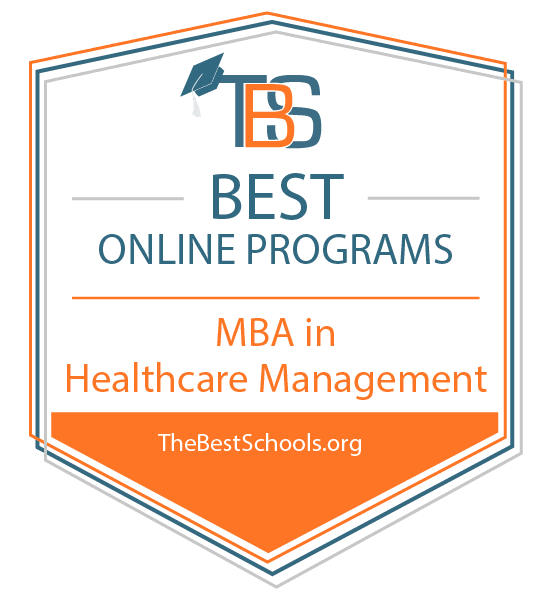 The online MBA with a certificate in healthcare management is fully accredited by the Association to Advance Collegiate Schools of Business (AACSB). While earning an MBA degree online, students learn core skills in management, finance, and healthcare to prepare for positions in healthcare management and administration. Most online MBA curriculums include management and finance courses. Business management courses often include business law, organizational leadership, and corporate ethics. Students learn foundational theories and best practices for leading a healthcare institution. Finance coursework explores economic principles and financial management solutions for practical problems. Healthcare courses typically focus on data collection and analysis, strategic planning for healthcare organizations, supply chain operations in healthcare, and evaluating healthcare quality. Many curriculums include electives, which students use to pursue studies relevant to their interests and ambitions. When selecting an online MBA program, students should also consider the school’s connection to the healthcare industry, such as whether the university places students in internships or management training programs. Also consider admissions requirements, standardized test scores, and program requirements, which may include a capstone project, thesis, and research project. Students should ensure program requirements align with their career plans. The best online MBA programs in healthcare management include coursework in business management and healthcare. Though curriculums vary between programs, some courses are common to most online MBA programs in the healthcare field. Most programs include coursework in finance, business administration, ethics, and marketing. Healthcare Informatics: This course explores the integration of technology and data science into healthcare. Students explore vendor selection and evaluation, electronic medical record storage, strategic planning, and infrastructure design. The course prepares students for positions working with data collection, storage, and assessment. Healthcare Finance: Learners apply fundamental principles of accounting and financial analysis to practical problems in healthcare finance and economics. Students use seminal cases, models, and texts to examine the landscape of financial healthcare before exploring solutions, such as managerial and risk management strategies. Evaluating Healthcare Quality: This course examines the concepts of quality and evaluation from the perspectives of providers, patients, and insurers. Students explore scientific and managerial standards of quality. Learners are prepared to work in regulatory environments or as compliance officers. Certified Revenue Cycle Specialist: The American Association of Healthcare Administrative Management offers numerous certificates, which set and maintain industry standards for healthcare finance professionals. The CRCS exam evaluates knowledge of the functional areas of revenue cycles. The two-hour certification exam is ideal for professionals who work with patient healthcare accounts. Certified Nursing Home Administrator: The American College of Health Care Administrators certifies nursing home administrators. Since there is no federal credential for nursing home administrators, this certificate serves as the national standard of professional excellence in the field. Membership in ACHCA is not a prerequisite to take the exam. Graduates of an online MBA program pursue a variety of career paths. The growing senior population is creating new executive positions in healthcare management. Professionals in the field often lead medical departments or manage staff in small private practices. Some healthcare professionals with an online MBA oversee fundraising for major hospital systems, and others manage financial resources of nursing homes. Medical and Health Service Managers: These professionals work in hospitals, nursing homes, and doctors’ offices. They plan medical services, direct organizational operations, and coordinate efforts among departments. They often work closely with patients, healthcare workers, and insurance companies to ensure efficient delivery of services. Medical and health service managers need leadership skills and current knowledge of healthcare regulations, laws, and practices. Top Executives: These strategic leaders direct personnel, policy, and activities for an entire department or hospital. Healthcare executives make decisions about finance and budgets, approve contracts and agreements, and appoint department heads. They need industry knowledge and management skills. Public Relations and Fundraising Managers: Public relations managers organize events, oversee digital and print material production, and manage advertising programs. Fundraising managers focus on accruing cash and gifts from public and private donors to support nonprofit organizations, such as hospitals. Both positions require knowledge of the healthcare industry and management skills. Prospective students considering online MBA programs should look for accreditation to ensure their credits and degrees will be recognized by other institutions and by future employers. The two most common types of accreditation are regional and national. Regional accreditation applies to an entire institution and is the most common and highly regarded type of accreditation. Six regional accrediting bodies evaluate U.S. institutions. National accreditation typically focuses on a specific program or field. For example, the Association to Advance Collegiate Schools of Business accredits business schools and programs. The best online MBA programs in healthcare management hold national and regional accreditation. Membership with a professional organization provides healthcare managers opportunities to explore new ideas in the field, attend conferences, work on committees, lead local chapters, and participate in continuing education programs. Current students and recent graduates of online MBA programs benefit from resources such as job boards and networking opportunities. Many organizations host regional and national conferences, and others offer certifications that help members advance their careers. Health Care Administrators Association: HCAA is a nonprofit association for third-party administrators. The organization hosts events, provides webinars, and maintains a job board. HCAA’s 18-month Emerging Leaders Academy provides thorough knowledge of healthcare administration for new leaders. American College of Healthcare Executives: ACHE offers educational resources, publications, and a job board. The organization also oversees board certification in healthcare management. ACHE presents awards to leaders who make outstanding contributions to the healthcare field. The American Association of Healthcare Administrative Management: Dedicated exclusively to the revenue cycle, AAHAM educates members and the public. The association also advocates for public policy related to reimbursement, data management, registration, patient relations, and medical records.